An innovative new program at St. Scholastica that will put a focus on integrated behavioral healthcare in rural communities is gaining public attention. The Duluth News Tribune featured an in-depth article about the program on Feb. 13. Last year, the College was awarded $1.33 million by the federal government to offer $10,000 stipends to graduate social work students working on their clinical requirements. 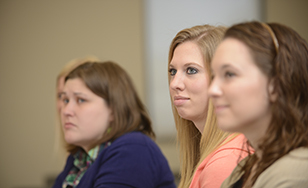 Qualifying students are committed to working in rural clinical settings in northern Minnesota and focusing on integrated behavioral health, an emerging trend that connects patients' health-related habits with their symptoms and diagnoses. Leaders in the College's Master of Social Work program used the funds to create The Rural Optimization of Behavioral Health for Underserved Settings and Trainees (ROBUST) initiative. ROBUST includes collaborations with partner agencies to develop new and enhanced field placement for the St. Scholastica social work students. Partners include Essentia Health, the Duluth Vets Center, the Human Development Center in Duluth, the Leech Lake and Fond du Lac bands of Ojibwe and St. Louis County Social Services.